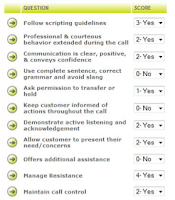 Do you use Quality Scorecards in your Call Center? Call quality scoring and scorecards are a significant component of quality management (QM). Rating agent performance is one way to reward your outstanding team members and identify areas where other agents may need additional coaching and training. It can also be used to rank agents at each center as a way of performance management, or also as a way to improve staffing and scheduling based on skills. 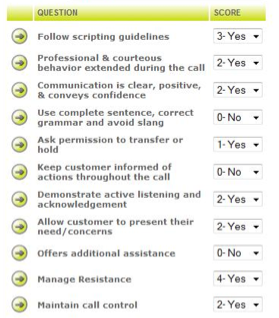 Different call centers use different types of quality scorecards. But as a general rule the process should not be too complex. Here are three typical scorecard formats that generate results. 1. Dividing the call into many parts In this scenario, every aspect of a call in separated and graded either on a 1-10 scale or a yes/no response to whether the agent handled that section correctly. Categories can include greeting, call opening, vocal quality, listening to customer, etiquette and closing. 2. Standard tasks vs. specific tasks In this QM system, a call is divided into the parts of the call that should remain standard from customer to customer (the agent’s opening, close, upsell attempts, etc. ), and those that are specific to each situation – alleviating the caller’s concerns, answering questions, handling complaints. Both sections are graded based on best practices and call center policy. 3. Open – middle – close Another method is to divide the quality score form into three sections – call open, middle and close. “Open” covers the greeting, “close” covers the scripted sign-off, and the middle refers to the actual call interaction. Since this is the most important aspect of each call, grading should be weighted accordingly. The open and close could count for 25% each, with the remaining 50% devoted to the bulk of the customer conversation. Whichever method is used, a quality management scorecard offers a valuable reference tool for determining which agents are doing well, which are missing key components of their customer interaction, and which need additional training. If you would like to learn more about this, please contact us for a personal demonstration of quality scorecards.